How I Shop for Groceries – I Don’t Go to Town! How often do you go food shopping for your family? Once a week? Do you stop by the store a few times a week? Here’s how we get our groceries for the week (or two or three) here in our Valley. 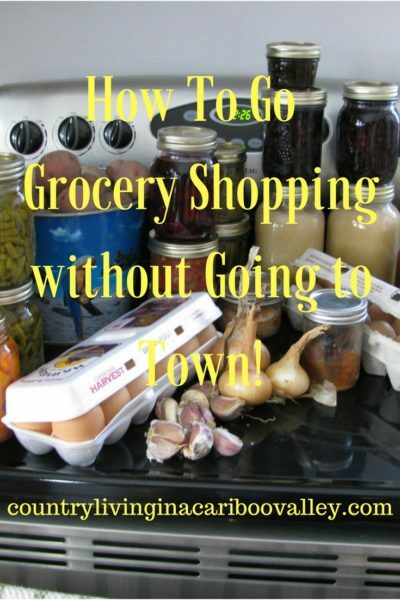 Come on along with me and see how I shop for groceries without going to town! 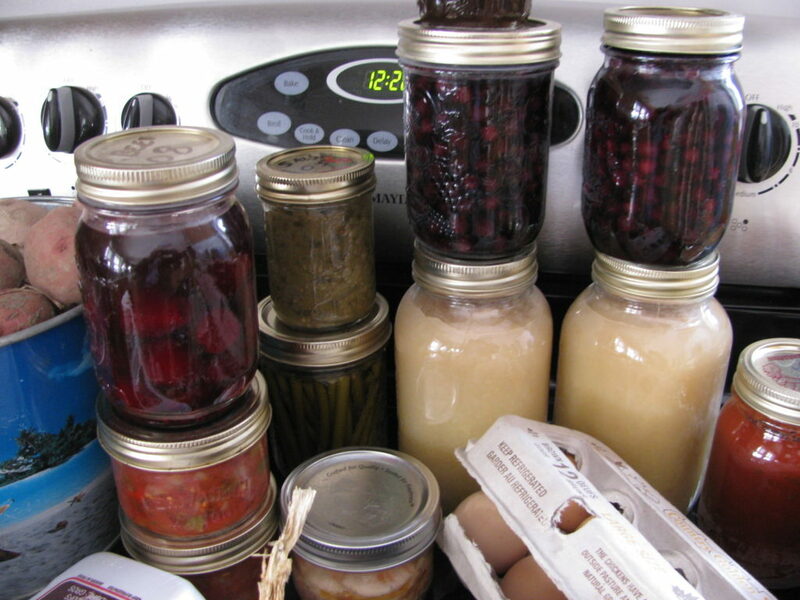 And I do it all by canning and preserving our own food. I have to remember to grab the green reusable bags. 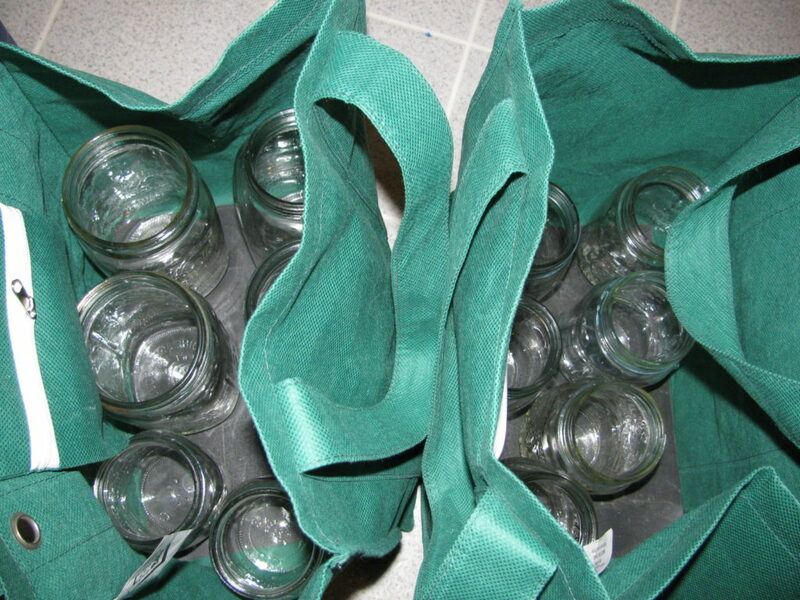 And I can’t forget to bring back the recyclable glass containers from the kitchen pantry. 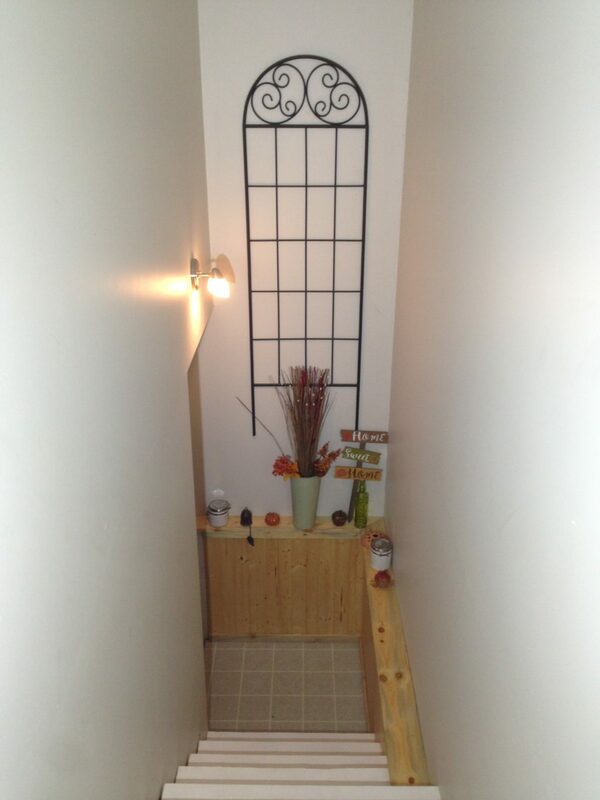 Instead of taking the car and driving to the grocery store, I’ll go down the stairs to the cold room. OK, we’ll definitely need some veggies so let’s get some beans for starters. And some carrots, we love carrots! We keep them in a pail of dirt and we trim the greens off low. Every now and then, we mist the dirt to keep it a bit moist. We could also use sand. Look how nice they still look. They are firm and they taste fresh and very sweet. 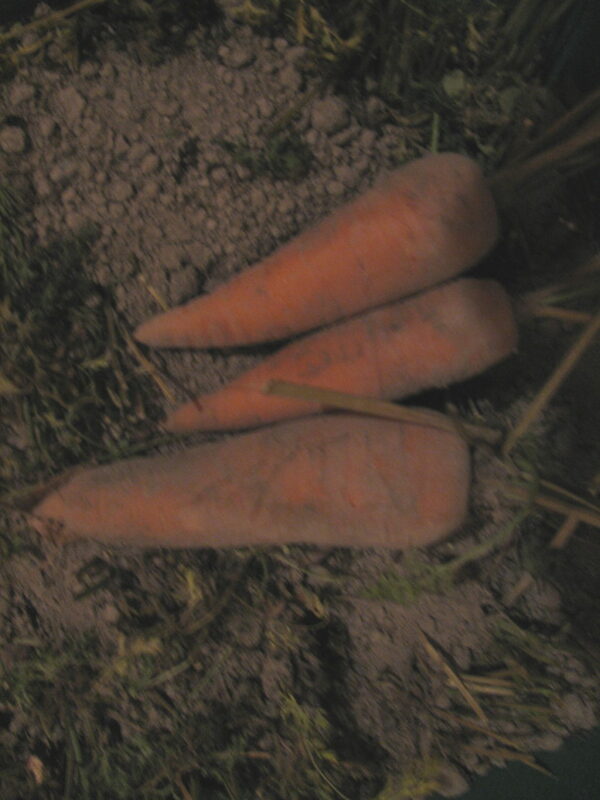 We have even left some in the garden, dug them up in April and ate them – they were delicious. Super sweet after all that winter cold. We definitely need a bucket of potatoes and also a bunch of onions. When I pulled the potatoes out of the garden, I sorted them right there in the field. 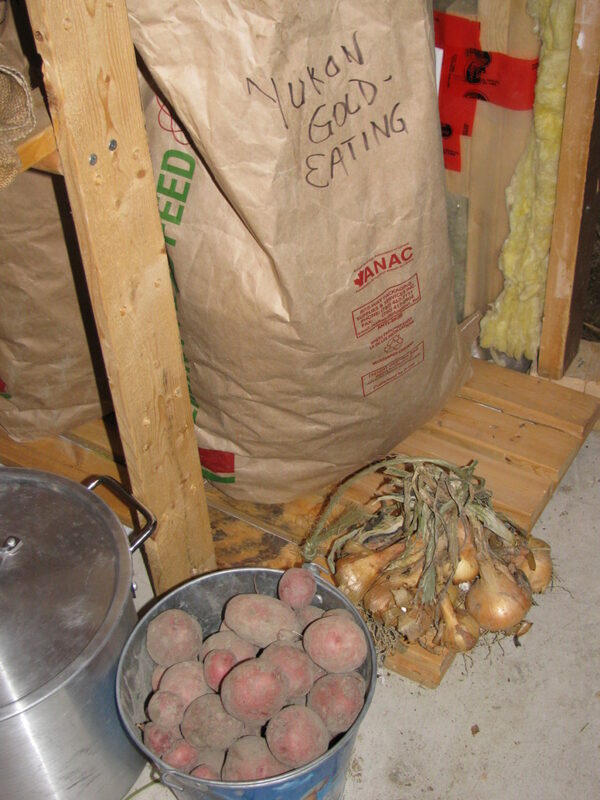 All our potatoes to be used as seed next year are sitting in separate bags on shelves in the cold room. 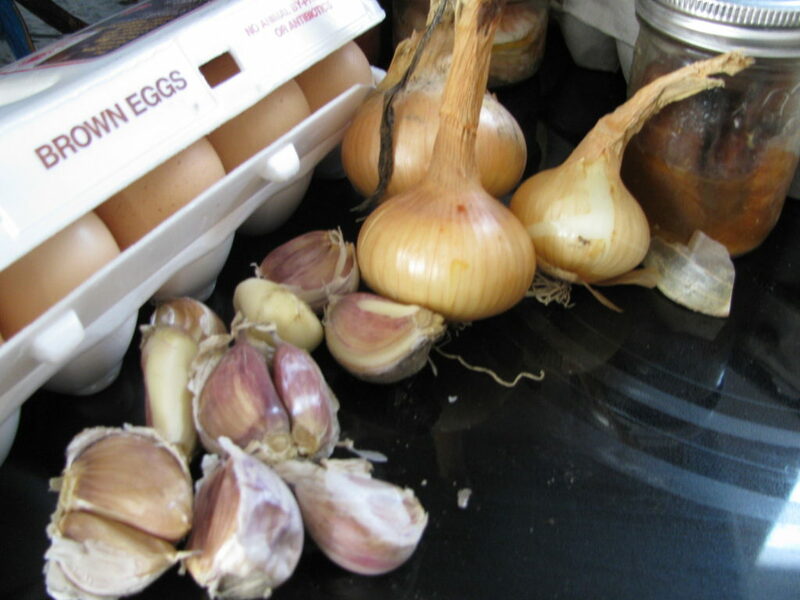 Keep your onions in a different room – they don’t get along too well with some other veggies in storage. Onions like it a little warmer than cold room temperatures. Now that my bags are full, it’s time to head back upstairs and put the groceries away. Check out what I’ve gathered. See the nice large chicken on the left? I pulled him out of the freezer. We raise chickens in the summer – by raising meat birds bred for fast growing, it is an 8 week time commitment for us and we get a lot of chicken in the freezer. Add the fresh goat milk that we get from one of our Valley friends and that should do us for at least a week. There is no need to go to town. And if I need to get more groceries, I’ll just go back downstairs to our cold room. This is the BEST way to shop for groceries! The bonus for us is that, by Growing what we Eat, we Know what we Eat! Healthy, Nutritious, Organic and very inexpensive! I love the way you presented this! Very good meals too! Hi Chelsea, You’re more than Welcome to come out to our place. 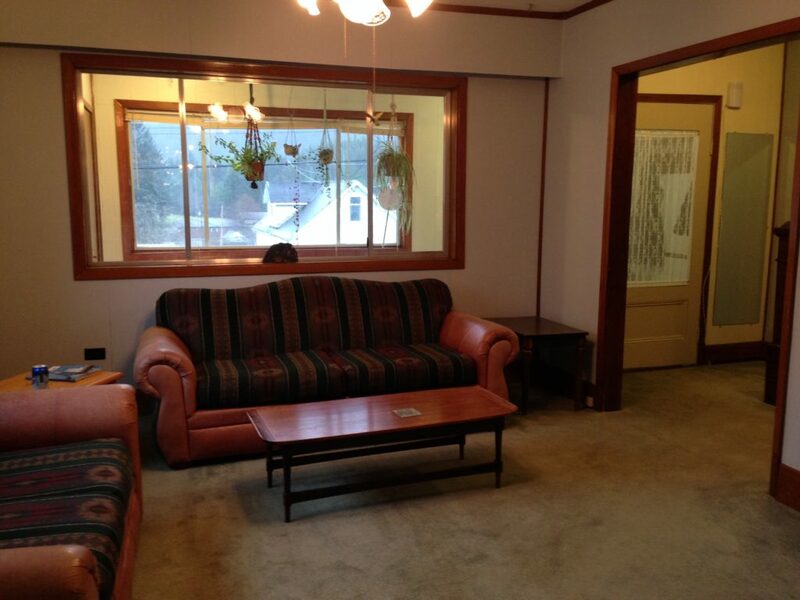 Come out next Spring when we’ve got more to show you…just send me off an email. I loved that as well… great post! I’m so jealous on so many levels! I will be starting my first Garden in a couple of weeks! Fingers crossed for good results, I have a blak thumb! Gardening in central Florida is a crazy, sandy business, althought the growing season is super long. 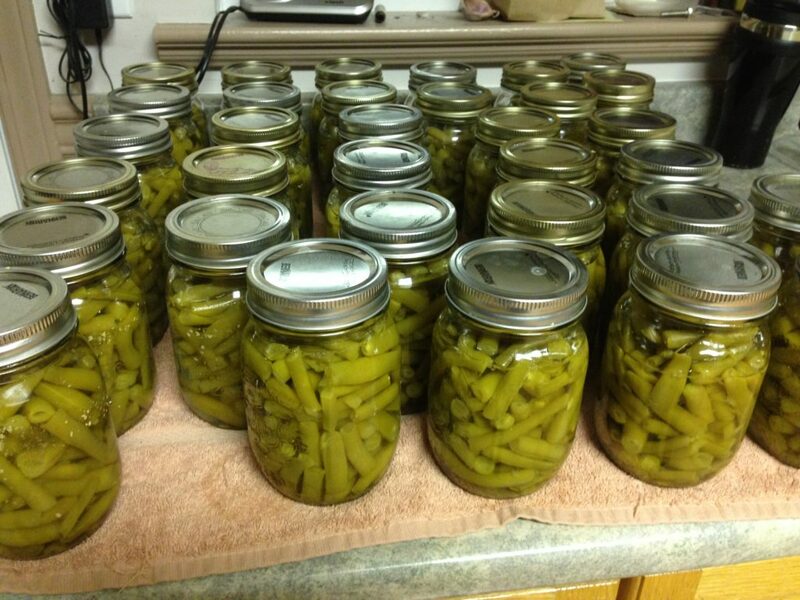 I have been canning for a while, and my goal is to be able to store up enough so I can shop just like you did. I’m also SUPER jealous of those Saskatoon berries! I spent a summer with friends outside Winnipeg, Manitoba and hunting those berries, canning and eating the resulting pies was the best! No matter what my Canadian friends say blueberries are not even close to the same! I love your blog and I’m learning a ton! Those Saskatoon berries are really good. Even in Canada they don’t grow everywhere, we never could grow them when we lived on the West Coast. I think maybe they need the really cold winters, although I am not sure. Saskatoons are wonderful, we also have them growing wild on our property. I have just ordered a few Haksap berry bushes to plant in the Spring. They are also wonderful in pies! And you are right, the wild Saskatoons do much better. I transplanted one into a flower bed and it has kind of struggled.. Maybe their roots don’t like being disturbed? I love your store! That’s my goal, for a few years from now when my littles are bigger and better at helping. 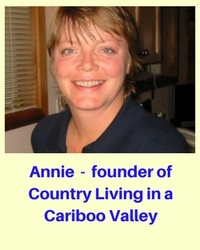 I’m in the cariboo too! This will be my first year trying to grow things in this area. I lived in the coldest parts of the okanagan before this. I really enjoy your blog! Thanks for your comments Rebekah, always love hearing from people who enjoy our site. Hopefully you are staying warm this winter; enjoy every wonderful thing the Cariboo has to offer! 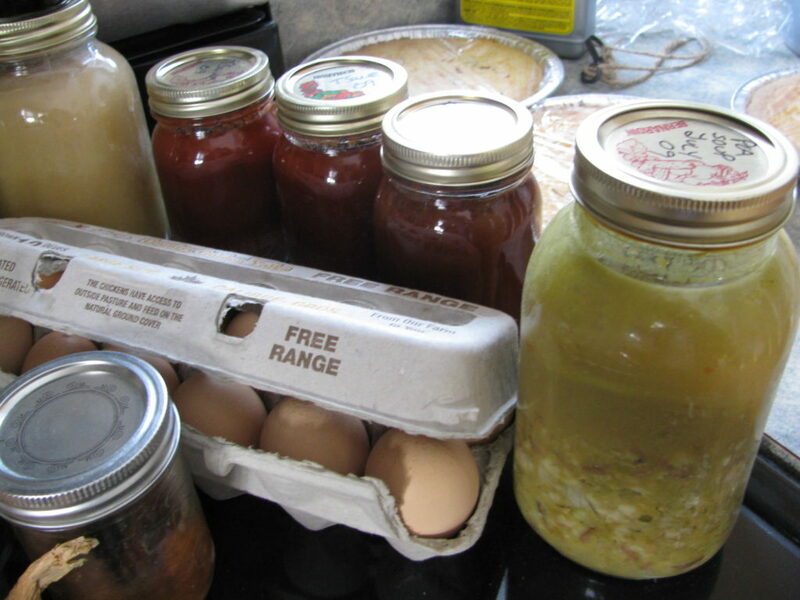 We have been filling up our root cellar, freezers and pantry too and this is how I shop all winter as well. I love it! Tonight we put around 800 lbs of potatoes in storage. Yesterday I went and bought our wheat, oatmeal, rice and rye for the year. We buy it in bulk and get really good deals and only have to truly shop for it once a year. We also picked up our 1/2 beef yesterday. Earlier we butchered our chickens and extracted the honey from our bee hives. This fall season is very busy but it is worth it in my opinion. You have sure been busy! Good for you, think of all that money you’ll save at the grocery store. In February we will be at our farm for a year. So far we’ve aquired 1 horse, 3 dogs, 2 rabbits, 6 goats, 3 calves, 12 chickens, and a family of 7 with 3 generations. This year I want to start a big garden with lots of veggies to can (hopefully) lol. I don’t have a green thumb so will be reading up your newsletter! Thanks for your help! Sounds like you have gone “all in”! You are going to have a very busy year, remember to have fun! You are living my pantry goals! 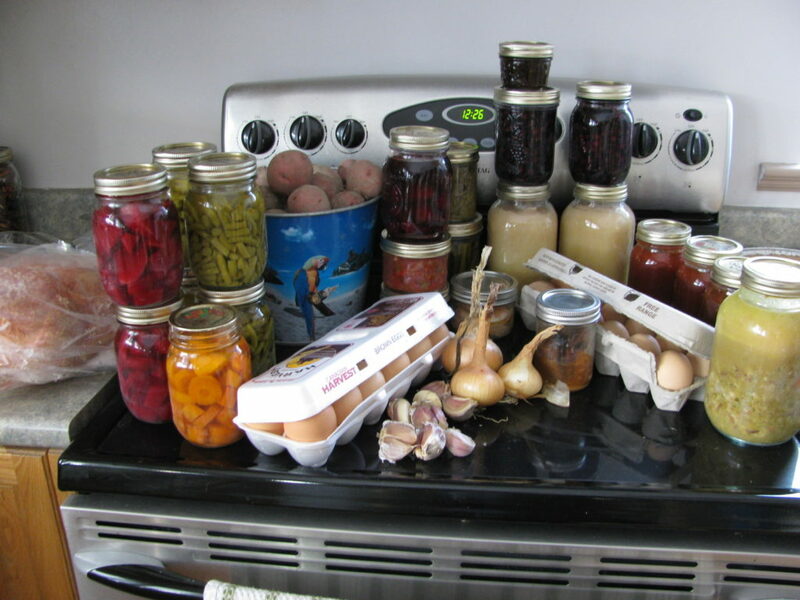 I canned for the first time this year, and am still eating onions from the garden, but I can’t wait until I can avoid going to town and shop in my pantry instead! Love it! 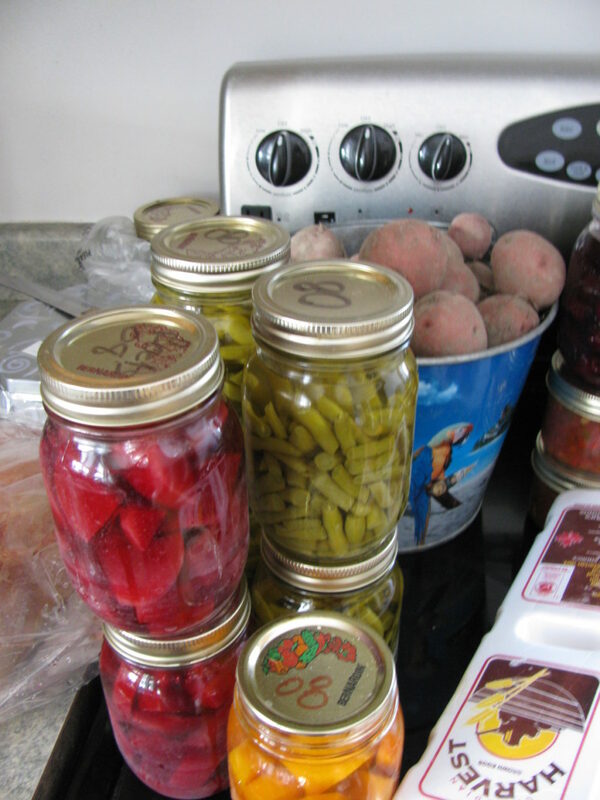 Hopefully you will be able to do even more canning this summer for next winter! If we had a cow, I’d never have to go to town. But then, I’d never get a lunch out and I need those every once in a while. But it’s so nice to know we can just stay at home for weeks if we want to. What can you do if your house sits on a slab? I live in the North Carolina and have no basement or cold room. 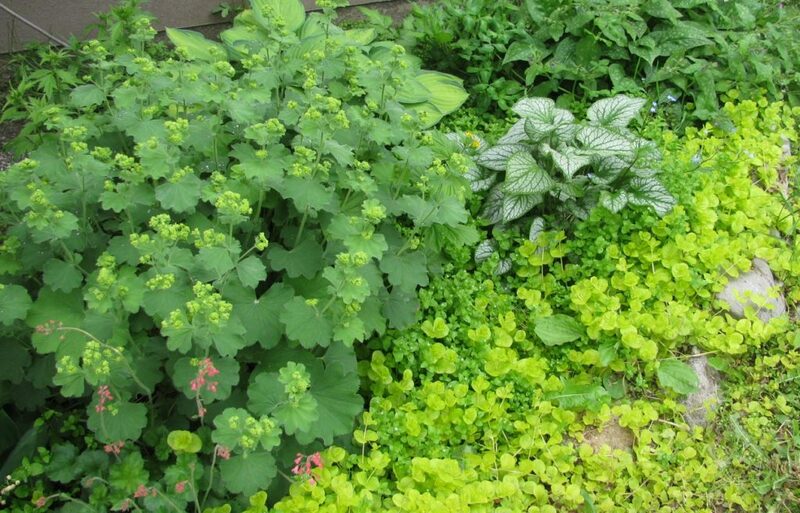 I can buy food to can but have a very small yard that’s shady most of the time which makes it difficult to grow veggies. I get more sun in the winter and could grow lettuces and cool weather type produce in a cold frame. Any suggestions?